It happens every, single year. Wait, let me re-phrase that: I let it happen every, single year. I go for my first swim of the season when summer is already halfway over. And I always regret it. Note to self: Start swimming when summer starts! It's glooorious! So this morning I tackled the bull by the horns and I did the whole shebang: I swam 600 m. Twenty-four lengths. But not in one go. No. In twenty-four. Yep, I needed a break after every, single lap. Ha! How will I ever be able to do it all without stopping?! Just like any other overwhelming task, I guess: One bite at a time. Baby steps. So watch this space! Major celebrations and obligatory cartwheels and happy dances anticipated for the day when I'm finally able to tackle those suckers two at a time ;). Well done for doing the distance anyway! Swimming is another monster and you are right...small steps. Swimming is hard! 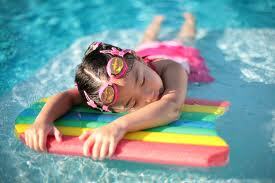 Well, swimming as exercise rather than just enjoying the pool is hard. :) Last time I swam laps, I took breaks after each one two. For what it's worth. Congrats on signing up for the tri!